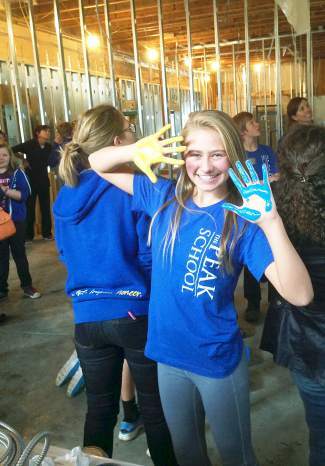 When The Peak School moved into the old Summit Daily building, students lent a hand (literally) to help build the new school. several parents and educators met weekly around a kitchen table and developed the idea to bring an independent school option to Summit County. Even with good public schools nearby, these individuals recognized that one size does not fit all. They were tired of losing dedicated staff and close personal friends who left the community in search of an educational alternative for their middle and high school students. At that table, an idea was nurtured and developed and The Peak School was born. When Peak opened its doors to students for the first time in August of 2012, the school was housed in rented space in the historic Colorado Mountain College, now the Breckenridge Community Center. Twenty-three students in grades 6 through 8 joined three full-time teachers, several part-time staff, and an army of volunteers for the first year of The Peak School. Following it's successful first academic year, in 2013 The Peak School purchased the Summit Daily News building to serve as the school’s new home. Teachers and students defined four classrooms and a large community room in the former home of the local newspaper. In the school’s second year, the community doubled in size totaling 48 students and six full-time teachers. In the fall of 2014 Peak welcomed eleven full-time staff and 63 students to its growing community in a newly renovated home, adding 5 new classrooms and 5,500 square feet of space. Peak’s third school year also marked the inception of the upper school, which celebrated it's first graduating class in 2017. Peak continues to have small class sizes, enabling teachers to personalize instruction and ensure that students receive individual attention. Our teachers are experts in their fields, and our staff consistently provides innovative instruction across the curriculum that emphasizes experience, rather than rote learning. Our belief in independent curriculum empowers a deeper way of learning, and we are committed to coaching students to develop themselves as learners and citizens.